Q: As a supervisor, I often find that trainees are overly rule-bound and rigid in the way they approach clients. How can I get them to loosen up and learn to trust their own gut instincts more? A: It's true that students often feel more secure approaching every clinical encounter strictly "by the book," and are frequently so afraid of making mistakes that they stifle their own capacity for therapeutic intuition and emotional connection with their clients. Sometimes freeing their therapeutic imagination requires bold steps. I remember one time, years ago, while teaching a graduate course in abnormal psychology, assigning an exercise to several class members in an attempt to help them understand what it feels like to be considered abnormal. I had them board a city bus during the morning rush hour and sit in the back. Then they were to yell out the name of each stop as the bus came to it. Half the students couldn't muster the nerve to complete the assignment, which drove home the point. Those who did follow through quickly found themselves sitting alone on the bus and feeling quite "odd." Getting students to loosen up and rely on their own instincts—use their own radar systems in therapy—is one of the greatest challenges for any teacher, and requires a willingness to be unorthodox. You must be able to let instinct be your guide, maybe to the point of mild wackiness. Gail was at a crossroads in her training. A highly intelligent and technically adept third-year psychiatry resident, she was wondering whether she'd chosen the wrong field. "I don't know what's wrong," she said to me one day during supervision. "I just can't get a handle on being a therapist." A newly married woman of 28, she wanted so much to do the right thing as a budding psychiatrist, but was somewhat rigid and a bit concrete in her thinking. For example, she'd told a patient who was struggling with a life decision for more than a year to "just decide and be done with it! "—failing to recognize that the "struggle" was the actual problem, not the inability to decide. She attributed her narrow focus to the pressure that science instilled in her to always be analytical and sharp. Whatever the reason, it wasn't the first time she'd complained in these terms, and in exactly this same, tired, discouraged tone of voice, and I was beginning to wonder whether she was in the right profession. "What do you mean you can't get a handle on being a therapist?" I asked, suppressing my own impatience. "I just don't think that I'm in touch with my patients," she said. "I'm going through the motions, asking all the right questions, using the proper techniques that I was taught, but something just doesn't feel right to me. It's just not clicking—I can tell by the look on my patients' faces." When I asked Gail what she thought she was doing wrong, she sighed and said she just didn't know. "Well, you say things just don't 'feel' right," I probed. "What would 'right' feel like to you?" She didn't know the answer to that, either. "I just know that it feels as if I'm doing therapy with blinders on—I just can't get a grip on what's happening," she noted. "And what's so bad about that?" I offered. "That describes what most of us encounter initially in the therapy process. Sometimes not really knowing what's happening is the best route to feeling your way into a real sense of your client's struggle. Sometimes you just have to let go of what you know and let the therapy flow along its own course." Gail looked at me as if I'd suddenly started speaking Farsi. "I just don't get it," she said flatly. I was close to telling her to just forget it, that I couldn't help her, when an idea popped into my head and I decided to try something just a bit weird. I had nothing to lose and, even if it didn't help her, the thought of trying it out made me feel better right away. I told Gail that I had an idea for her next supervision session. Instead of watching her with a client, I'd meet her at the nearby Starbucks, and then we'd go to an unnamed destination. All she should do to prepare for this outing was to think about a shape. "It can be any type of shape someone might hold in his or her hand. I just want you to think about that shape and what it would look like, and keep the image fixed in your head." Gail all but rolled her eyes at this apparent tomfoolery, but nodded her head. "Fine," she replied sardonically. A week later, Gail and I trekked across the snow-covered medical-school campus toward a Gothic-style structure known as the College of Arts. When she'd said she couldn't get a handle on being a therapist, the word, hands popped into my mind. So I'd arranged for a colleague in the art department to allow us to use one of the pottery wheels. 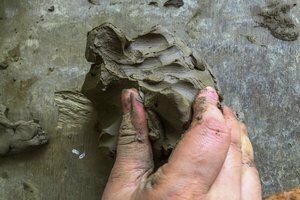 I sat Gail down in front of the foot-driven wheel, plopped a lump of wet clay in front of her, and told her to try to form the shape that she'd been thinking about all week on the pottery wheel. With a bucket of water to her right and a towel on her knee, Gail began to pedal the wheel and dove into shaping the amorphous lump into the image that had been percolating in her mind. "You're so weird," she said, laughing nervously. "I know," I replied, "but just be patient with me and think about feeling your way around this undefined shape until you've molded it into the form you want. But first, we need to add one crucial thing." I took out a blindfold and covered her eyes and said, "Now I want you to make that shape you've been carrying around in your head." "Remember the shape in your mind and then mold this clay into that shape the best way you can," I instructed. "This is ridiculous," she said. "I don't understand what this is supposed to prove." She was becoming a little agitated, but I persisted. "Look, just see if you can do it. Keep the shape in your head and form it as you go along. Try to work at translating your thoughts to feelings as you feel out the shape of the item in your mind. Focus on the emotional sense of struggle and try to rechannel it by creating the shape you desire." As Gail began to form her shape—a cherished vase she'd recently broken by accident—I suggested that by feeling the actual form evolve through her fingertips and molding the moist clay, she might begin to develop a sense of freedom to follow her instincts, to let herself go and wing it—the kind of freedom required when doing therapy. As I talked, it occurred to me that the same thing was happening to me as a teacher. In guiding Gail, I was being guided by my own intuitive sense of how to communicate with her. This experience was as much a revelation for me as I hoped it would be for her. I remembered that during my own early learning, when I was working with difficult families, I'd felt similarly to Gail. I also recall that I was helped enormously by an unexpected experience—attending a concert. The concert opened with the crashing of kettledrums. It was as though the drums were alerting the audience to the fact that the percussion was to play a very important role in the concert. After a time, the drums fell silent, while the other instruments in the orchestra laid down a solid foundation of sound. Then the drums joined in again and blended with the orchestra. What struck me that evening was the concept of keeping some themes silent for a while, which is sometimes the way families cope with certain dynamics or stressors. Initially inspired by that concert, this insight regarding the ebb and flow of communication has remained with me during the course of my work as a psychotherapist. About a half-hour later, with much laughter and a little bit of cursing, Gail had created her vase out of a shapeless mass. I took off the blindfold and said, "Okay, take a look." Gail made a show of being unimpressed. "Ooh, did I make that?" she jeered sarcastically. "So, what's your point?" But she was smiling and her eyes were bright—at least she showed more energy and spirit than she had for some time. "You need to do something like that with your clients," I said. "Don't always be so driven by the rules. You can't be afraid to try something outside your usual frame of reference. You might want to try not to be so calculating and take a risk—just like I did with you. Risk letting yourself not know how things are going to turn out all the time with your clients." Hearing this, Gail sat up straight in her seat as if she were intent on taking a new posture. As we talked further, we agreed that you need a good therapeutic plan—a directional map—once therapy is well underway, but that, sometimes, you must first feel your way blindly along in the dark to determine which direction you want to go, what strategy you want to use. Whatever techniques and interventions you use, you can't neglect your basic instincts about people—the gut-level intuition, that helps shape the course of therapy. Letting go and being patient are integral to finding your way. Gail was definitely intrigued, yet still puzzled. "But I don't feel I have a real sense of collaboration with clients during treatment—that feeling of working together with someone." I told her to think about the clay; once she allowed it to happen, wasn't the clay really guiding her fingers? "Sometimes you simply have to let go in therapy and trust that you'll discover the way by allowing it to emerge, particularly in the beginning, when clients are very guarded. Use your delicate fingertips," I urged. "With the clay, you combined your sense of feel and touch with your knowledge of what you were trying to shape. It was instinct as much as intellect that allowed you to make your vase." The same thing held true for therapy, I told her. "You have to trust your 'fingertips'—your own feelings—as much as your brain. If you can let yourself take a risk and not feel you have to calculate every move, a real felt understanding of the situation and the people involved will emerge. And out of that, your sense of collaboration during the course of treatment will begin to take shape, as well as your sense of mastery." In my subsequent supervisory meetings with Gail, she appeared a lot less anxious and discouraged. "It's still a struggle for me, but I'm learning to let go. I think about that pottery wheel a lot, and I've put that crummy vase I made on my desk at the office to remind me to 'let go.'" In later sessions, Gail reported that she was making headway with her patients and had actually begun to look forward to seeing them. Gail's memory of this important lesson will consist in part of that sloppy mess of clay that she was able to turn into something resembling a vase while blindfolded. And when she gets stuck in her head, unable to "think" her way through a tough case, perhaps she'll remember her eccentric supervisor. Perhaps she'll not only recall his advice, but also how she "got it"—just as I, to this day, recall those kettledrums. This blog is excerpted from "Throwing Away the Script" by Frank Dattilio. The full version is available in the January/February 2006 issue, "Is Your Waiting Room Still Waiting? : How to Create a Successful Private Practice." Love this article! Trying to teach new therapists to rely on their intuition is always a struggle. Thank you!!! Carl Jung once said: "Learn your theories well, but set them all aside when you confront the miracle of the individual soul".